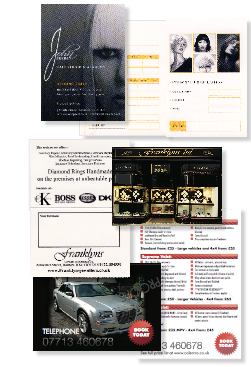 Appointment card printing (for less than 1p each) Ideal for Hairdressers, Beauty Salons, Nail Bars, Dentists, Doctors, Vets. These high quality appointment cards are printed on the finest 250gsm card creased ready to fold in half. The face has a high gloss UV varnish finish. The inside surface can be easily written upon with pen or pencil. These appointment cards are available with a UV high gloss varnish to one side, leaving a writeable surface to the inner side. We print from your artwork, or we produce professional artwork for you at reasonable prices. (Available in A7 75x55 or A6 105x74 ~ folded size). How do I pay for Appointment cards ? Do I need artwork for Appointment cards? Prices subject to a delivery charge (if applicable) and VAT delivery time does not include artwork preparation - E.O.E.